Learn more about Pillars of Eternity 2: Deadfire's different cultural origins and the unique bonuses each will bestow. Much like its predecessor, Pillars of Eternity 2: Deadfire is a massive game. However, before players are let loose to sail around the world, recruit companions, and take on various quests and battles, they'll need to create their own hero. Part of the character creation process involves choosing the hero's origin location, a small but still-significant choice that provides some flavor for the hero's upbringing as well as one of seven different passive attribute bonuses. Read on to learn more about the Pillars of Eternity 2: Deadfire origin locations and their associated bonuses. Among the bewildering array of character customization options is the choice for the player to choose their hero's place of origin. Though the choice largely plays into the character's own backstory, it does provide a distinct bonus to one of six different attributes, and may or may not affect how other non-player characters respond to the hero. 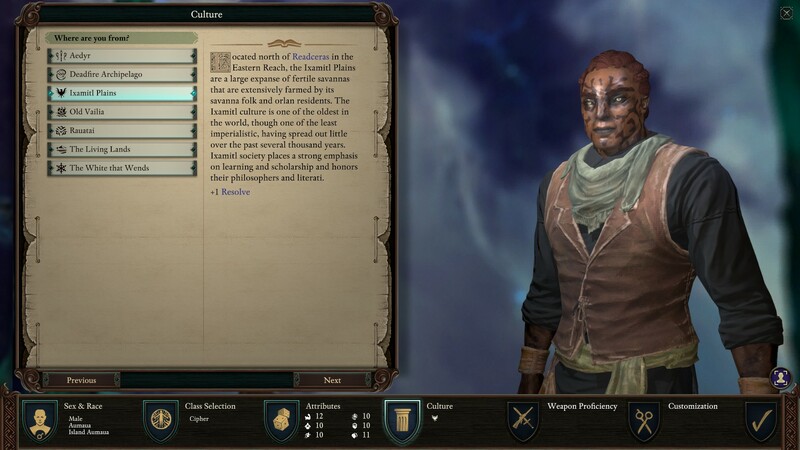 Here are all of the available cultural origins and related bonuses in Pillars of Eternity 2: Deadfire, with descriptions pulled straight from the game. "The Aedyr Empire is one of the most prominent Old Empires of the west. It is centered around the Equator and has a tropical climate. The nation of Aedyr is at its heart and houses the majority of its human and elven populace. Aedyr was once a powerful colonial force, but the loss of Readceras and the Dyrwood reduced its stature. Aedyrans are common in the Eastern Reach, but rare in the Deadfire Archipelago." "The Deadfire Archipelago marks the eastern edge of the "Known World." Dominantly populated by island aumaua who make up the tribes of the Huana, the chain of hundreds of islands span thousands of miles. The Deadfire contains myriad climates and biomes that are home to a bewildering array of creatures. The last century has brought ambitious colonial traders, explorers, and pirates to the Deadfire, but travel east of the archipelago is blocked by the destructive storms of Ondra's Mortar. "Legends among the Huana speak of an ancient cataclysm that devastated their people thousands of years ago. Details of this event have been lost to time, but Huana storytellers claim that it destroyed everything they had built, sinking even the greatest of their cities beneath the waves." "Located north of Readceras in the Eastern Reach, the Ixamitl Plains are a large expanse of fertile savannas that are extensively farmed by its savanna folk and orlan residents. The Ixamitl culture is one of the oldest in the world, though one of the least imperialistic, having spread out little over the past several thousand years. Ixamitl society places a strong emphasis on learning and scholarship and honors their philosophers and lterati." "Once the crown jewel of the southern seas, Old Vailia is now the crumbled remnants of an empire of warring merchant nations. Counting many humans and dwarves among their ranks, the Old Vailian countries are still forces to be reckoned with and are proud of their rich cultural heritage. The southernmost of the Old Empires, Old Vailia suffered a similar fate to their northern neighbors, the Aedryans, in losing their most prosperous colonial territories, the Vailian Republics. Many Old Vailians in the Deadfire Archipelago are associated with the Principi sen patrena, a vast coalition of pirates." "The powerful naval kingdom of Rautai is dominated by coastal aumaua and ruled by a ranga nui. Currently the most prosperous of the Old Empires, Rauatai has expanded aggressively into the Deadfire Archipelago to secure natural resources that are scarce in their native, storm-torn land. Though folk, dwarves, and orlans can be found in the Rauatai, most are merchants or remnants of the old kingdoms Rauatai conquered when they seized power centuries ago. "Legends say that the Rauataians came to their lands from the Deadfire Archipelago in the wake of a terrible cataclysm, bu the details of that event have been lost to time and the imagination of storytellers." "The Living Lands is the mountainous region of a large northern island renowned for its diversity of plant and animal life. Its weather is unpredictable and its ecosystems vary dramatically from valley to valley. The Living Lands are home to an assortment of races in a variety of colonial and independent settlements." "A large, cracked southern expanse of polar ice, the White that Wends is home to pale elves and small colonies of daring explorers, outcasts, and adventurers. While virtually no plant life grows in the White, it is home to many hardy species of dangerous animals that forage from the sea or prey upon each other to survive." Emboldened by a greater understanding of the game's many different cultural origins, be sure to head over to our Pillars of Eternity 2: Deadfire walkthrough and guide hub, where we break down more crucial character creation options and dive into some of the biggest challenges presented in-game.